This entry was posted in Immigration and tagged Athens August Edinburgh London Royal Mile Scotland scotland immigration Scottish Government Scottish independence on September 24, 2013 by Blog Author. While some people might think that living in Athens would be a good experience, current economic crisis apart of course, I would suggest that living in “The Athens of the North” might be a better bet. You might not get the high temperatures and the number of hours of sunshine but Edinburgh has SO much more to offer than that. This magnificent city lies on the south east coast of Scotland, is the capital city and seat of the Scottish Government and is, at the moment, the centre of a long-running political campaign regarding independence for Scotland from the United Kingdom. It is one of the world’s most visually dramatic and vibrant cities and, throughout the year, is a major cultural capital with a number of world-class events taking place around the city, both drawing visitors from not just the United Kingdom but from the world over. August is a major focus for many with the International Festival taking place throughout the month. The finest exponents of classical music, theatre, opera and dance gather to present one of the most innovative and accessible Festivals of the performing arts. This year’s festival saw over 2,200 artists from 36 nations, including almost 800 from Scotland, filling Edinburgh’s stages in 220 performances and events over 24 days. Overall, 80% of all available seats for performances were sold, with nearly half of the festival’s performances sold out. It is estimated that over 400,000 people from Scotland and around the world visited the festival, with approximately 158,500 tickets sold. Every kind of performance that you can imagine was included, an unusual addition this year being an epic Chinese version of one of Shakespeare’s least-performed plays, Coriolanus. The Military Tattoo is an annual festival of martial music, ceremony, entertainment, and theatre performed in front of the dramatic and imposing structure of Edinburgh Castle, set high on a hill above the city. 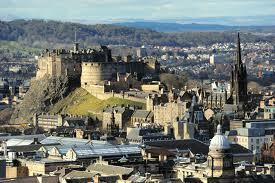 This year’s event, The 64th Royal Edinburgh Military Tattoo, was held over a three week period in August. Incredibly it was sold out every night – in fact this was the 15th consecutive year that every ticket was sold. Overa thousand performers -musicians, singers, dancers and military personnel – from across the United Kingdom, as well as the Middle East, Korea, Mongolia, New Zealand and Mexico were there this year. The themes this year were The Year of Natural Scotland and Our Wonderful World, focusing on natural cycles within nature and the beauty of the Scottish landscape. Festivals aside though, the city truly is a wonderful place to live. It is surrounded by dramatic landscapes and has stunning Georgian architecture everywhere you look, particularly along the “Royal Mile” stretching all the way down from the imposing castle to the royal palace of Holyrood. Edinburgh has a rich cultural history in science, philosophy and art from the enlightenment era and is divided into two parts, the Old Town and New Town. Curiously the “New Town” actually dates from the 18th century and, with some of the finest Georgian architecture in the world, is a highly desirable place to live. Getting to and from there is easy. The city is well served for transport links with an international airport, a high speed rail link to London plus the A1 Great North Road.